Albion defender Connor Goldson has been back in light training this week and is still on course to be back for pre-season. The 24-year-old has been jogging this week, after he was ruled out for the season in early February when he was identified as having a possible risk factor from a routine cardiac screening. He has since had preventative surgery and Seagulls boss Chris Hughton revealed the squad were all delighted to see the popular defender back on the training ground. He said: "It's very positive and everything we've got back from his progress has been very good, so we anticipate him building it up now. "He's not going to play any part this season but I think it's more emotionally what it means to the squad (seeing him back in training). "For any player to have the scare that he has had and the operation that goes with it, it's something that we all think about and don't want anybody to go through. "Fortunately for Connor it was found at the right time, which is testament to the club and the work they do and the screens these players have. "We're really looking forward to him being back in pre-season and competing next year." Sam Baldock could return for Albion's match with Bristol City on Saturday but Shane Duffy is set to miss the last two games. Baldock, who has been out for six matches with a glute injury, was back in training today and will be assessed ahead of kick-off. 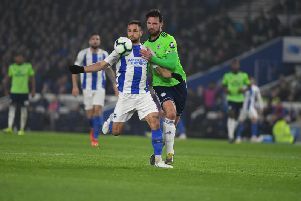 However, Hughton does not expect Duffy, who broke a metatarsal away to Nottingham Forest at the beginning of March, to be involved again for the club this season. He said: "He hasn't trained yet and has been out for a period of time, so I don't see him being involved. "But he's got the all-clear, the healing has been very good and I suppose from Shane's point of view, his next target will be the international games that he's got coming up."